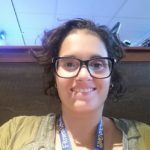 Although she was diagnosed with Multiple Sclerosis (MS) fifteen years ago, Maya Levi has never let it determine her life. She is always full of energy, always optimistic. Even now, as the disease starts to profoundly limit her life physically, she is discovering new spiritual and physical pathways within life’s limitations. MS is a disease that affects central nervous systems, thus the brain and the spine. Immune cells attack the myelin layer around the nerve cells, resulting in damage to neural functions and an impaired electric signal. The wide range of symptoms—e.g., balance problems, muscle weakness, blindness—vary from person to person, depending on the specific location that is damaged in the brain or spinal cord. The common prognosis, though, is the worsening condition over time. Maya’s symptoms have always included balance problems—but in the last year, the signaling to the legs has been so far damaged that walking has become extremely difficult. However, the point of Maya’s story is not to focus on her disabilities caused by MS. The focus is on enabling her still existing abilities, thus strengthening her body and soul. 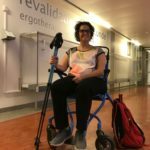 On the GoFundMe campaign started by her friend Lidia Bernabei, Maya tells us that although using a wheelchair might become inevitable, she wants to explore new opportunities to do as much as she physically can, to empower herself. She invites us to financially support the activities that she would like to do, but otherwise cannot afford. 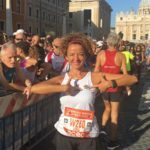 In September, Lidia ran a half-marathon (20 km) in Rome to raise not only funds for Maya but also awareness for MS. Delft MaMa Nina Bogerd ran in Ljubljana, Slovenia in October, and Andrea Ortenzi ran in New York in November. 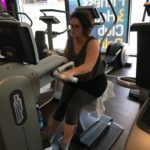 These runs are steadily raising awareness for MS. Maya is currently training at the gym (weights) and on an indoor hand bike as a part of her physiotherapy and hopes to participate in a half-marathon with the hand bike in Rome in September 2019. If you plan to run somewhere the coming year, you can also dedicate your run to this campaign. The funds raised so far has enabled Maya, among other things, to start taking horseback riding lessons. These lessons have had an extensive impact on her body, mind and soul. But more specifically to her MS, the horseback riding forces Maya’s core muscles to stabilize her body. 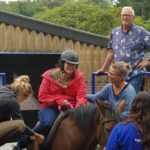 The lessons are taking place in Madurodam Manege, that specializes in horseback riding for people with disabilities. 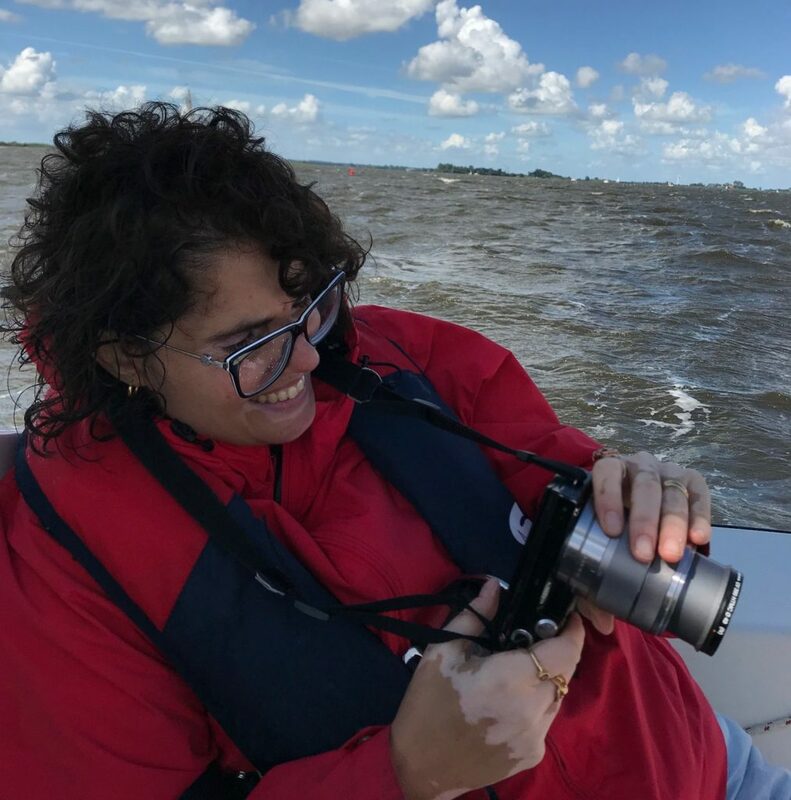 In addition to horseback riding, Maya has been able go wind sailing again, and plans to continue that next year thanks to Sailwise, a foundation that organizes adapted sailing activities for people with physical challenges. At this moment Maya is unable to leave the house independently with the kids—she is dependent on her husband, ‘Regio Taxi’ (Municipality Taxi’s), and friends as she only has a manual (borrowed) wheelchair. A mobility scooter has been approved in September by the municipality but is not yet in place. Maya would like to have an electric folding wheelchair for traveling with her family. She would also like to have a hand bike with exchangeable wheels that can be connected to a wheelchair. This would allow Maya, a biologist, to go outdoors and enjoy nature. These are expensive products that can improve Maya’s quality of life. Maya should not be alone in her struggle. 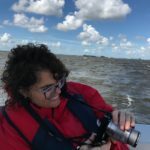 To help Maya further, we are organizing a High Tea on the 9th of December, 2018, at Lunch Café Leonidas Delft. Money collected will go to Maya’s GoFundMe campaign. You are cordially invited to an afternoon dedicated to supporting one of our heroic mothers. Thanks to Nina Bogerd and Maya Levi for contributing to this post.